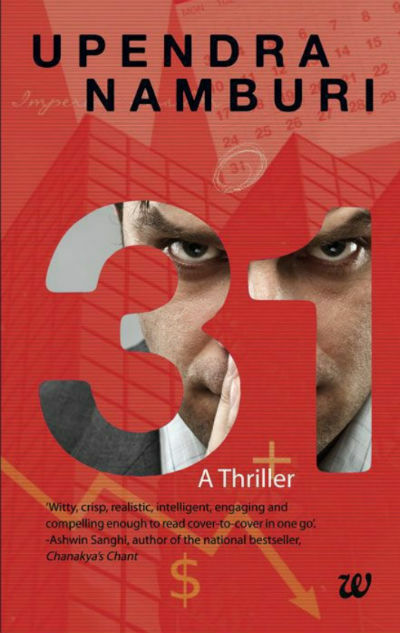 Recently we got a chance to read 31 (Numbers Book 2) by author Upendra Namburi and we love to share our unbiased Book Reviews for the same with you all. Upendra is a professional who works in the finance world and thus he know a lot of internal details about the same, especially the day to day functioning. Of course, he is aware of the way the stretegies build and more importantly, executed at the ground level. It comes up nicely in this book. Let us take a look at the cover page of 31. The blood red background is eye-catcher. The number 31not judging a book from its cover but the fact is the cover page influence read and/or purchase decisions at a large extent. In that sense, the book makes a long-lasting impression for sure. The cover page remains true to the book and the story explored. 31 refers the 31 days of March, the most important month of the financial year in India. And that is the time span of the story. The protagonist works in a bank at a remarkable position and lives with his nuclear family. His wife is also working for a reputed company. The things are working fine for them and they are living a good life. The month of March is always hectic for the professionals who are somehow associated with the finance world in India. But the things started taking unexpected turns for the protagonist and his family, friends, and colleagues in an unexpected way. And, it is just the beginning. The loss the bank made in some foreign country has an unexpected effect on the well-functioning Indian counterparts of the same! In one country their loss reach to billion from millions and the management tries to scapegoat the Indian branches (which are making a good profit) to use the profit (from India) to nullify the loss (in foreign). And, that is not it. When there is a large amount of wealth associated, the power automatically comes there. Often it results in greed, lust, and craving for more. No relation remain pure and unaffected. The friends can be transformed into foes when it comes to their own survivals! Anyway, the situation is getting worst at his wife’s end also! Her company is also closing its India operations and is planning to move out soon! To add to that the protagonist’s wife found herself pregnant! So, the things are challenging at both professional and personal level for both of them. And, for the many characters, we meet in the book. What happens to them is better to explore in the tale full of twists throughout. The book remains true to its genre. As it is said, the truth often found stranger than the fiction. And, some of the things written in the book may sound filmy or strange but may be realistic in some context. And, the exploration of the story is done in such a way that it holds the reader’s attention throughout. Each of the chapters starts with an illustration and a phrase written below that, which are meant to represent the soul of the chapter. Here is an interesting one. You can bank on us… but not with us! The unrealistic expectations of the bosses make an employee feel exhausted and he/she often start questioning the common sense of the superiors. Can’t they see the situations at the ground level? Such feelings get vent when having a personal/family time. The book has some fantastic punchlines. The feeling of helplessness hurt the most! And yes, Upendra is good at the wordplay. I was surprised at myself for being surprised again! These were new days, new principles. And a new Principal! At the same time, he represents the dilemma of an employee at a little mature stage of his/her professional life, quite effectively. And those who have had a little longer professional life can easily relate to that. There were two points of view. The first suggested that working too long in an organization made one less flexible. The other indicated a higher level of dedication and commitment. Who says that the battles are fought at the border only? Each and every place where more than one people are competing with each other is a battlefield in its own perspective! Some of the lines of the book will remind you of the same in an effective manner. I’m a foot soldier in the trenches, Mayur. What’s happening with the generals? This wasn’t an introductory session. This was an ambush to show who was boss! The hard and harsh truths of life are explored in the book in a realistic manner. The way the things happen in the real world which make people suffer (often in an unjust way) and the reasons behind that are talked about are not only realistic but effective too. Ravi, the problem with allegations is that even if they prove to be wrong, suspicion still lingers. The classic technique of throwing doubt. Speculate or better still, trigger rumours … till they become reality. The greater the frequency and amplitude, the more real they become. It is better to be feared than loved … if you cannot be both? Prohibition and laws have historically been one of the greatest stimulants for crossing the line. There are several things in the book which might have been better explained. For example, the reveal of confidential details on the Twitter handle! How is that possible? Not in terms of, how this inside information can be availed. The source of the information is revealed at the climax. But making this information available in the public domain? And a Bank let it happen? I can’t digest it. Competitors can use this information against it, of course. And, in this cut-throat corporate world, it is the reality more than the possibility. The adverse effect on the stock options of the company surely will result in the downfall of the shares! So, the author could at least mention that the tweets of the a/c were private to its followers (actually they should be protected to those who that handle follow)! Anyway, such smaller things can be avoided while reading a thriller, but the reason I mention it, is, it is weaved as a thread in the book. Oh yes! It finally clicked. Her parents invited themselves over. Here is an example of good sarcasm but wrong punctuation (I think an “!” instead of “?” is required for the highlighted instance. Hey, Ravi still at work? Don’t ever accuse me of working? I am guilty of coming into office, but nothing else! I winked at him. In terms of value for money, I bought the book during a promotional offer (Kindle edition) and for me, it is worth the money and more importantly, the time spent reading it. I will suggest you keep an eye on various offers running at various shopping sites and grab the deal at the right time :). We, of course, share news about most of such book deals on our social media handles and if you follow us, you will surely be notified automatically. There is a little dose of adultery and a few cuss words and phrases. While it may add to the authenticity, it may not go well with some of the readers. Of course, the book is meant for adult readers only. Overall, it is a good package for thriller lovers. Definitely, at least 7.5 stars out of 10.